Vera&John is a colourful online casino that has been around since 2011 and they have managed to establish quite a reputation in a short period of time, mostly thanks to a very good selection of top titles from more than 15 software providers. Operated by Dumarca Gaming Ltd., a company licensed in Malta, the casino is focused around attractive video slots, but also houses a live casino, mobile casino and plenty of exciting player promotions. Restricted Countries: USA, France, Italy. (For USA casinos click here). As soon as you sign up with Vera&John, you will be able to claim a 100% bonus match on your first deposit, up to €100. But, taking into account the 40x playthrough requirements, you could have a hard time trying to turn bonus cash into real money. 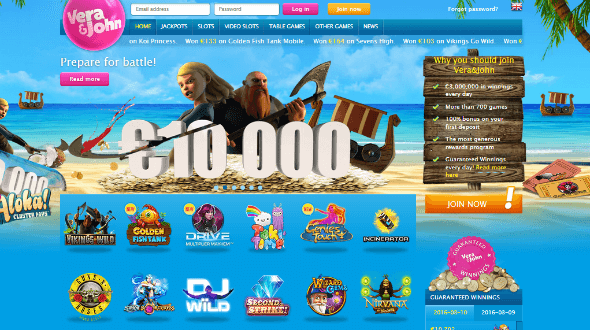 The casino runs numerous promotions for existing players such as March Madness, €5,000 Guaranteed Winner and regular promos linked to new releases. Their Rewards Program is designed to help players accumulate casino coins over time and then exchange them for special bonuses, tournament tokens or merchandise in the store. It was the casino’s decision to offer their customers the best casino games from all over the world that proved decisive, and their players can now enjoy premium titles from 16 software providers that include NetEnt, Microgaming, Yggdrasil, BetSoft, Thunderkick, Play’n Go and Quickspin. If you should decide to join their ranks, you will gain access to over 700 realistic casino games, where video slots take the centre stage. Some of the latest games you can play at Vera&John are Guns N’ Roses, Drive: Multiplier Mayhem, Crystal Queen and Golden Fish Tank. Vera&John offers a very good selection of over 40 progressive jackpot games, numerous Blackjack, Roulette and Video Poker variants, Keno, Scratch Cards and more. A premium live casino has got to be mentioned as well, with NetEnt’s Casino Cosmopolitan, Casino Singapore and Casino Paris featuring a wide array of high-quality live dealer titles that offer an unparalleled gaming experience. We have been quite satisfied with available payment options at Vera&John, as they support most popular banking solutions such as Credit Cards, Debit Cards, e-wallets, Prepaid cards, Bank Transfer and even mobile payments. Card deposits incur a 2.25% fee, whereas other payments come free of charge. At the same time, all cashouts of €50 or more are completely free, whereas withdrawals lower than said amount come with €5 flat fee. The casino clearly promotes responsible gaming considering that they offer session limits, loss limits and login limits to all customers. If you are looking to play on the go, Vera&John is a perfect choice. 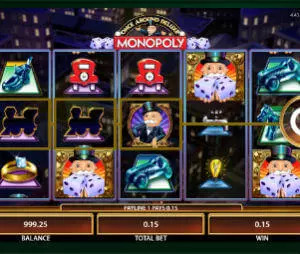 The casino was built with mobile play in mind: there is a huge variety of mobile slots, the signup process is extremely simple and it operates on every smartphone or tablet. Vera&John is all about providing their customers with the best possible gaming experience, so you are unlikely to have any objections on top titles from 16 software developers as well as high-quality live casino and mobile casino. And while they do seem to offer enough promotions for existing customers, we would have liked to have had access to some reload bonuses or a better welcome package.